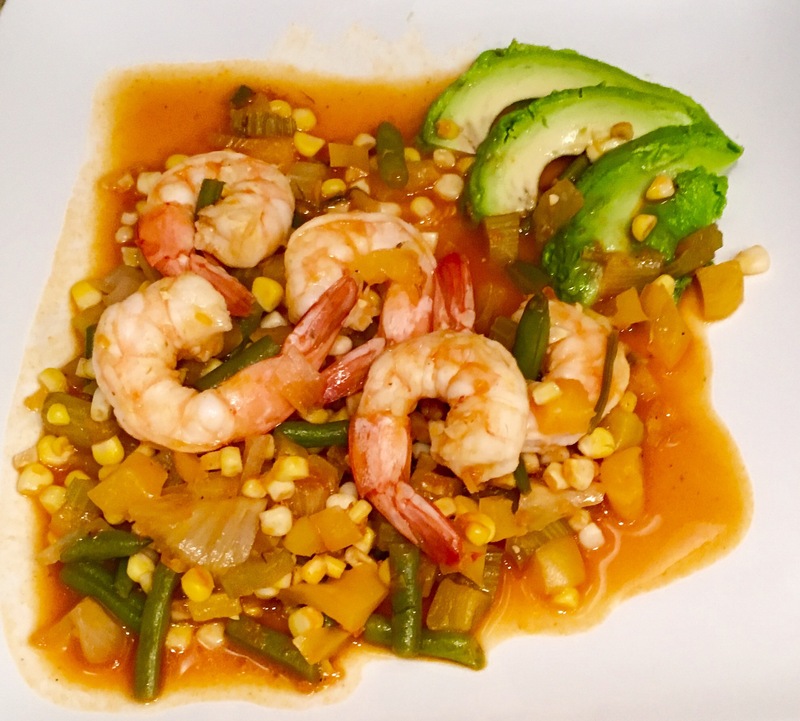 Summer shrimp… – Eat, Drink, and Go! Since it was a nice warm day, I was inspired to make summer shrimp. My idea of summer shrimp is nothing specific, it’s simply shrimp with a sweet, summery attitude. It varies each time. Tonight, it was accompanied by a medley of fresh corn, chopped fennel and celery, green beans, and yellow peppers. I sautéed the veggies in a mild BBQ sauce, thinned out with a little water so the veggies would soak it better. I let the veggies sauté in order (celery and fennel first, then corn, then peppers and green beans). After the sauce bubbled and reduced down a bit, I added the shrimp and covered it til the shrimpy got pinky. Don’t over cook shrimp, once they’re pink with an opaque white center, they are done. That’s all!! Add slices of avocado on the side because avo is fabulous. Top with fresh ground pepper. Enjoy!! I enjoyed my favorite white wine with this – Nobillo Sauvignon Blanc.